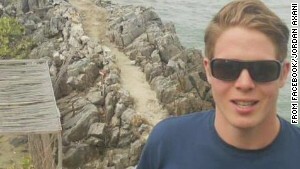 (CNN) -- Jordan Axani planned to travel around the world with his girlfriend Elizabeth Gallagher, until they broke up. Now, he'll embark on Sunday on the circumnavigation with Elizabeth Gallagher. No need for a double-take: The name may be the same, but the person answering to it isn't. Axani had booked his-and-her airline tickets in his name -- and his girlfriend's, he said. So, after his ex went overboard, he had to find a new co-passenger with the same name, he said, because the tickets were non-transferable. Axani is Canadian, as is his ex, so the new Elizabeth Gallagher needed to be, too, to make the switch work. So, he took to social messaging service Reddit to find her. After threw out the offer in early November for a free round-the-world trip, social media posts avalanched down at the hashtag #ElizabethGallagher. Elizabeth Quinn Gallagher from Nova Scotia quickly tweeted Axani a photo of her passport. Scrawled on the shot in hot pink, the words "Take me!!!" He did, he announced on Wednesday, but though "Quinn" came at him straight out of the chute, making the final choice wasn't that simple, Axani said in a statement. Many deserving women had contacted him. Some of their stories told of such compelling real-life heartbreak and perseverance, that Axani started a crowd-funding initiative, A Ticket Forward, to buy trips around the world for them, too. The first four he hopes to fund are a victim of Lymphoma, a single mother with an autistic son, and two women who fled violence in their native countries. But Axani settled on Quinn from Cole Harbour, Nova, Scotia, as his travel partner. He said she stood out with her volunteer work at a homeless shelter and her wish to become a social worker. From the get-go, Axani told prospective EG's that he would put no pressure on them to do him any favors. He was not looking for his ex's doppelganger to mend a broken heart. "I am not looking for anything in return. I am not looking for companionship, romance, drugs, a trade, or to take selfies with you in front of the Christmas Market in Prague," he wrote. But he had nothing against a few bills to sooth the financial pain. "If you feel compelled to toss me a couple hundred bucks, great. Really the only thing I ask for is that you enjoy this trip and that it bring you happiness." Axani and Elizabeth Quinn Gallagher are to depart New York City on Sunday for Milan, Italy. From there, the two will hop to Prague, Paris, Bangkok, New Delhi and back to Axani's home of Toronto, provided Canadian authorities allow the new Elizabeth Gallagher to board with the ticket booked for the ex. CNN has reached out to the Canadian Air Transport Security Authority to find out whether they have any security measures in place that would prevent Elizabeth Gallagher 2.0 from traveling.